Why choose Pavtube ByteCopy for backing up DVD movie collections? Because the software offers easiest and fastest DVD to MKV backup solution- lossless DVD to MKV backup is shorted into a 3-step process and takes no longer than 10 minutes! Do not hesitate to download a trial of Pavtube ByteCopy and follow the easy guide below to backup DVD to MKV with fastest speed and flawless quality. Step 1. Run Pavtube ByteCopy software, put source DVD into DVD-ROM, Click “Load Disc” button to import movie titles from DVD. The software decrypts DVDs of all regions. The main movie of the DVD will be checked automatically. Step 2: Click "Format" to choose “Multi-track Video > Lossless/encoded Multi-track MKV(*.MKV)”. This lossless/uncompressed MKV container can preserve DVD chapter markers , multiple subtitle and audio tracks and lossless video quality. Tip: Click Settings to open a new windows as below. You can choose which subtitle and audio tracks to keep. You also can choose to rip DVD with DTS 6 channels or AC3 6 channels 5.1 surround sound. Step 3. Click the “Convert” button to start lossless DVD to MKV backup. Basically it takes less than 10 minutes to complete lossless DVD to MKV backup. No other DVD to MKV ripper can be faster. The snapshot below shows that I have copied DVD movie to MKV with 7 minutes and 20 seconds. After conversion you may click “Open Output Folder” to find generated MKV files. The output MKV file contains all original video streams, audio tracks and all subtitles. Multiple streams are sealed into MKV container without transcoding, which means you get lossless DVD backup. MPEG video, AC3 5.1 audio, subtitles of multiple languages, DVD chapter markers, everything is included in the MKV file. That’s what MKV format means and that’s how Pavtube ByteCopy beats other DVD backup tools. Here I post the media information of ripped DVD movie for your reference. 1. 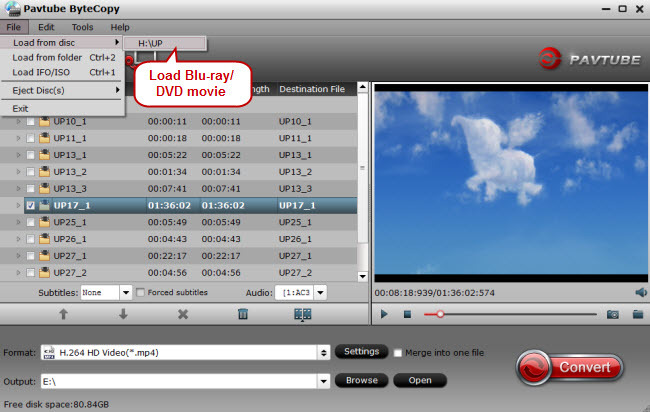 Pavtube ByteCopy supports both DVD and commercial Blu-ray Discs, up to the latest ones. 2. Pavtube ByteCopy copies BD/DVD to MKV as fast as your drive can read data. A fast BD drive can copy Blu-ray movie of 25GB in half an hour. 3. Pavtube ByteCopy lets you decide which contents to backup, you can keep desired audio tracks, subtitle streams, and video titles (by default menus and ads are removed). 4. Pavtube ByteCopy encodes BD and DVD contents. You can shrink a BD of 25GB to less than 10GB for saving storage. 5. Pavtube ByteCopy lets you edit streams individually. You can either pass-through the HD audio (TrueHD 7.1, DTS-MA, etc), or down convert the audio to AC3/DTS 5.1 audio. 6. Pavtube ByteCopy is priced at $42 only (an extremely competitive price) and is free of upgrade for lifetime. You purchase it once and forever.